Twenty officers from the Air Force, Navy, Marines, and from Singapore, the United Kingdom and Australia, completed the one year curriculum at the U.S. Air Force Test Pilot School at Edwards Air Force Base, Calif., to graduate as Class 16B June 9, 2017. 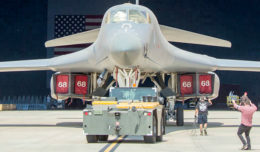 Class 16B includes 11 experimental test pilots, seven flight test engineers, one experimental remotely piloted aircraft operator and one experimental test combat systems officer. 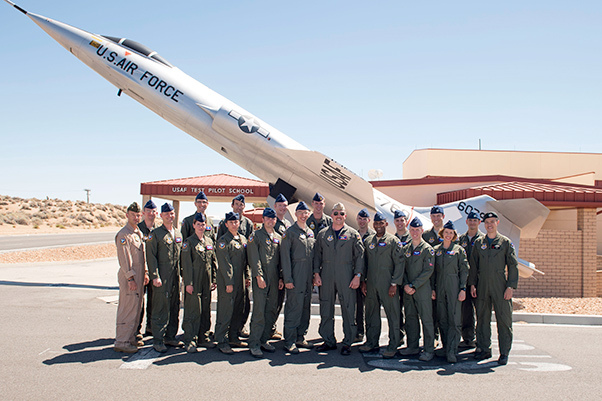 Twenty officers completed the one year curriculum at the U.S. Air Force Test Pilot School at Edwards Air Force Base, Calif., to graduate as Class 16B June 9, 2017. Upon graduation from TPS, Class 16B includes 11 experimental test pilots, seven flight test engineers, one experimental remotely piloted aircraft operator and one experimental test combat systems officer. Students from the Air Force, Navy, Marines, and from Singapore, the United Kingdom and Australia worked as teams during the year to complete over 2,500 hours of academics and 120 hours of flight training each. As a final graduation exercise, the students demonstrated learning by planning and executing real-world test management projects. The test management projects were also the equivalent of an academic thesis, as the graduating students also earned a master of science degree in flight test engineering. Four student awards and three distinguished graduates were presented during the graduation ceremony. The student awards were: Capt. 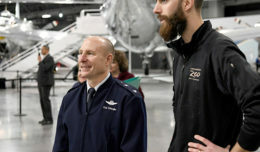 Chris Thorn, the student who exemplifies the warrior-focused attitude to find and field the best weapons systems possible; Maj. Ryall Meyer and Capt. Chris Thorn, who contributed most to class spirit and morale; Capt. Anthony Puntel, outstanding flight test engineer or navigator; and Maj. Jonathan Bearce, outstanding test pilot. The distinguished graduates were Maj. Jonathan Bearce, Capt. Anthony Puntel, and Maj. Chris Taylor. The overall objective was to demonstrate autonomous wingman capability to execute routine tasks in a virtual threat environment. Part of a multi-year ongoing partnership with Lockheed Martin, this project demonstrated a dynamic mission planning element to command the VISTA F-16, which operated as an autonomous “wingman” executing simulated attacks while navigating around simulated threat rings. The overall objective was to demonstrate the navigational capability of a multi-antenna, multi-receiver system using advanced algorithms. A C-12 was modified with four GPS antennas and four GPS receivers to compare multi-receiver blended solution to traditional methods this was the first full-scale airborne application of this technology which may be used in the future to provide a navigation solution in GPS-denied environments. The overall objective was to evaluate the capabilities of a new helmet aircrew and mounted physiological sensor suite that measure aircrew physiological response under moderate load. A long-term goal of these technologies is to allow for real-time monitoring of aircrew physiological performance and provide feedback or take measures during aircrew incapacitation. The test team used T-38s for in-flight data collection and used the centrifuge and altitude chamber to collect ground test data. Overall objective was to demonstrate a passive celestial navigation solution and the ability to detect a laser designator during a diving profile. This project was a partnership with Draper Laboratories to support ongoing development of navigation techniques, as well as a risk-reduction effort for a sensor for a guided artillery round. The sensors were housed in the RASCAL pod and carried on both an F-16 and T-38. This was the first use of a RASCAL pod on a T-38 for a test management project.